This event is being co-sponsored by the Harvard Data Science Initiative and the Berkman Klein Center for Internet & Society. Event introduction and moderation will be provided by Elizabeth Langdon-Gray, Executive Director of the Harvard Data Science Initiative. Event will be live webcast and recorded at 12:00 pm on day of event. The growth in availability of digital data resources is changing university practice in more ways than most faculty, administrators, and students are aware. Researchers provide open access to their data as a condition for obtaining grant funding or publishing results in journals, leading to an explosion of available scholarly content. Universities have automated many aspects of teaching, instruction, student services, libraries, personnel management, building management, and finance, leading to a profusion of discrete data about the activities of individuals. Many of these data, both research and operational, fall outside privacy regulations such as HIPAA, FERPA, and PII. Universities see great value of these data for learning analytics, faculty evaluation, strategic decisions, and other sensitive matters. Commercial entities, governments, and private individuals also see value in these data and are besieging universities with requests for access. These conflicts pose challenges in balancing obligations for stewardship, trust, privacy, confidentiality – and often academic freedom – with the value of exploiting data for analytical and commercial purposes. This talk, based on a new article in the Berkeley Law and Technology Journal, draws on the pioneering work of the University of California in privacy and information security, data governance, and cyber risk. The growth of information studies, as reflected by the international expansion of iSchools, reflects a broad research and teaching agenda in social, technical, institutional, and political aspects of the information society. As data science, scholarship, and stewardship are central to the iSchool agenda, they provide a framework to launch the new iSchool at Linnaeus University. Whereas almost all fields of scholarship today are conducting data-intensive research, only a few areas are adept at exploiting “big data.” “Little data” remains the norm in those many fields where evidence is scarce and labor-intensive to acquire. Until recently, data was considered part of the process of scholarship, essential but largely invisible. In the “big data” era, data have become valuable products to be captured, shared, reused, and stewarded for the long term. They also have become contentious intellectual property to be protected. Public policy leans toward open access to research data, but rarely provides the public investment necessary to sustain access. Enthusiasm for big data is obscuring the complexity and diversity of data in scholarship and the challenges for stewardship. Data practices are local, varying from field to field, individual to individual, and country to country. As the number and variety of research partners expands, so do the difficulties of sharing, reusing, and sustaining access to data. Until the larger questions of knowledge infrastructures and stewardship are addressed by research communities, “no data” may become the norm for many fields. This talk will explore the stakes and stakeholders in research data, focusing on implications for iSchool policy and practice, drawing upon the presenter’s book, Big Data, Little Data, No Data: Scholarship in the Networked World (MIT Press, 2015), and subsequent research. the American Association for the Advancement of Science and of the Association for Computing Machinery. At UCLA, she directs the Center for Knowledge Infrastructures with funding from the Alfred P. Sloan Foundation and other sources. The Pufendorf Institute invites you all to a symposium to explore issues concerning the boundaries of interdisciplinarity in practice and theory. The symposium will highlight these from different perspectives, focusing on the prerequisites, organisation, process and practice of interdisciplinary research. We will also address and discuss the Pufendorf Institute's model for crossboundary collaboration. The symposium is open to all those who are interested in interdisciplinary research and want to explore how to support crossboundary collaboration in different ways and on different levels. The invited speakers will highlight "interdisciplinarity" based on their own research and several of them will approach the subject from different philosophy of science perspectives. Drawing on 20 years of studying data practices in the physical sciences, life sciences, medicine, engineering, and technology, this talk will address the question of “How is ‘interdisciplinary’ done?” by presenting several case examples. One scenario from the Center for Embedded Networked Sensing will illustrate how one research team’s evidentiary signal may be noise to another team with whom they are collaborating. A scenario from the Center for Dark Energy Biosphere Informatics will illustrate how methods decisions made early in the data collection process determine how and whether other disciplines can make use of physical specimens later. The third scenario, drawn from astronomy, will demonstrate how data taken from a single instrument can diverge in form and evidentiary value when processed by scientists in multiple sub-disciplines of the field. While data sharing and reuse are concerns in all of these fields, concepts of data “use” differ widely. 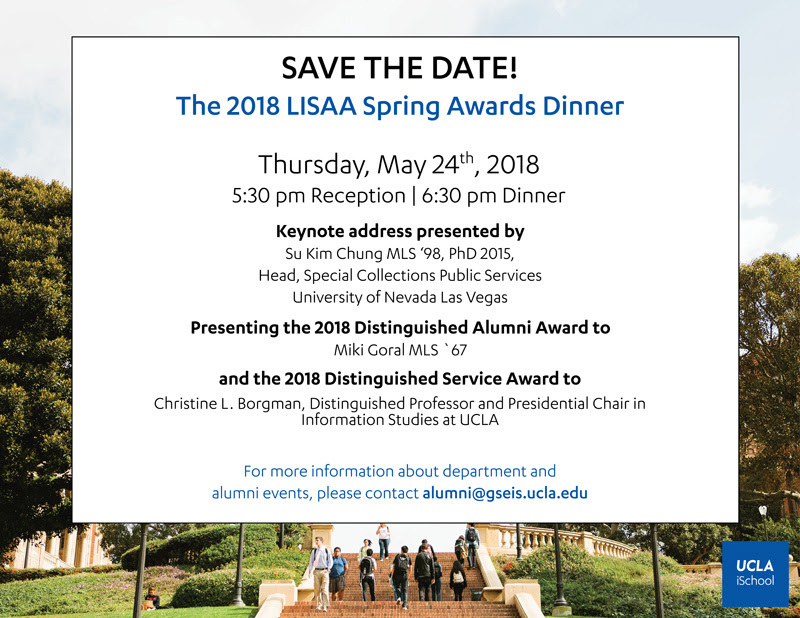 Christine L. Borgman, Distinguished Professor and Presidential Chair in Information Studies at UCLA, is the author of more than 250 publications in information studies, computer science, and communication. These include three books from MIT Press: Big Data, Little Data, No Data: Scholarship in the Networked World (2015), winner of the 2015 American Publishers Award for Professional and Scholarly Excellence (PROSE Award) in Computing and Information Sciences; Scholarship in the Digital Age: Information, Infrastructure, and the Internet (2007); and From Gutenberg to the Global Information Infrastructure: Access to Information in a Networked World (2000). The latter two books won the Best Information Science Book of the Year award from the Association for Information Science and Technology (ASIST). She is a Fellow of the American Association for the Advancement of Science and of the Association for Computing Machinery. At UCLA, she directs the Center for Knowledge Infrastructures with funding from the Alfred P. Sloan Foundation and other sources. While the popularity of “big data” reflects the growth of data-intensive research, “little data” remains the norm in those many fields where evidence is scarce and labor-intensive to acquire. Until recently, data was considered part of the process of scholarship, essential but largely invisible. In the “big data” era, data have become valuable products to be captured, shared, reused, and stewarded for the long term. They also have become contentious intellectual property to be protected. Public policy leans toward open access to research data, but rarely provides the public investment necessary to sustain access. Enthusiasm for big data is obscuring the complexity and diversity of data in scholarship and the challenges for stewardship. Data practices are local, varying from field to field, individual to individual, and country to country. As the number and variety of research partners expands, so do the difficulties of sharing, reusing, and sustaining access to data. Until the larger questions of knowledge infrastructures and stewardship are addressed by research communities, “no data” may become the norm for many fields. This talk will explore the stakes and stakeholders in research data, in interdisciplinary research, and implications for policy and practice, drawing upon the presenter’s book, Big Data, Little Data, No Data: Scholarship in the Networked World (MIT Press, 2015), and subsequent research. Join experts from projects such as ADS, glue, WorldWide Telescope, Dataverse, Science Education, Library, js9, and Chandra to demonstrate software that makes research, data-sharing, visualization, teaching and outreach more “Seamless”& more fun. MIT will host a working summit on the Grand Challenges in Information Science and Scholarly Communication March 19-23, 2018. Inviting experts from across disciplines and sectors, the summit aims to identify critical problems in information science that are solvable within 10 years and which have broad implications across the scholarly community. The University of California has pioneered digital library services for the last four decades, since the early days of Melvyl and the Division of Library Automation. These services now encompass bibliographic records, digital content, research data, and more. Data stewardship reflects the array of digital library challenges in both theory and practice. While the popularity of “big data” reflects the growth of data-intensive research, “little data” remains the norm in those many fields where evidence is scarce and labor-intensive to acquire. Until recently, data was considered part of the process of scholarship, essential but largely invisible. In the “big data” era, data have become valuable products to be captured, shared, reused, and stewarded for the long term. They also have become contentious intellectual property to be protected. Public policy leans toward open access to research data, but rarely provides the public investment necessary to sustain access. Data practices are local, varying from field to field, individual to individual, and country to country. Until the larger questions of knowledge infrastructures and stewardship are addressed by research communities, “no data” may become the norm for many fields. This talk will explore the stakes and stakeholders in research data and implications for policy and practice, drawn from the presenter’s recent book, Big Data, Little Data, No Data: Scholarship in the Networked World (MIT Press, 2015). Presented at the Galactic Center Group Workshop 2017, Luskin Conference Center, UCLA, Los Angeles, CA. While the popularity of “big data” reflects the growth of data-intensive research, “little data” remains the norm in those many fields where evidence is scarce and labor-intensive to acquire. Until recently, data was considered part of the process of scholarship, essential but largely invisible. In the “big data” era, data have become valuable products to be captured, shared, reused, and stewarded for the long term. They also have become contentious intellectual property to be protected. Public policy leans toward open access to research data, but rarely provides the public investment necessary to sustain access. Enthusiasm for big data is obscuring the complexity and diversity of data in scholarship and the challenges for stewardship. Data practices are local, varying from field to field, individual to individual, and country to country. Until the larger questions of knowledge infrastructures and stewardship are addressed by research communities, “no data” may become the norm for many fields. This talk will explore the stakes and stakeholders in research data and implications for policy and practice, drawn from the presenter’s recent book, Big Data, Little Data, No Data: Scholarship in the Networked World (MIT Press, 2015). Data sharing has become normative policy enforced by governments, funding agencies, journals, and other stakeholders. Reasons for data sharing include leveraging investments in research, reducing the need to collect new data, addressing new research questions by reusing or combining extant data, and reproducing research, which would lead to greater accountability, transparency, and less fraud. Much of the scholarship on data practices attempts to understand the sociotechnical barriers to sharing, with goals to design infrastructures, policies, and cultural interventions that will overcome these barriers. Yet data sharing and reuse are common practice in only a few fields. Astronomy and genomics in the sciences, survey research in the social sciences, and archaeology in the humanities are the typical exemplars, and remain the exceptions rather than the rule. The lack of success of data sharing policies, despite accelerating enforcement over the last decade, indicates the need not just for a much deeper understanding of the roles of data in contemporary science, but also for developing new models of scientific practice. This presentation will report on research in progress, funded by the Alfred P. Sloan Foundation, to examine three factors that appear to influence data practices across domains: How does the mix of domain expertise influence the collection, use, and reuse of data and vice versa? What factors of scale — such as data, discipline, distribution, and duration — influence research practices, and how? How does the centralization or decentralization of data collection influence use, reuse, curation, and project strategy, and vice versa? The 10th Annual BCLT Privacy Lecture will be presented by Christine L. Borgman, Distinguished Professor and Presidential Chair in Information Studies at UCLA and Director of the UCLA Center for Knowledge Infrastructures. Prof. Borgman will explore the clash between two trends. One is for academic researchers to provide open access to their data in connection with grants and publications; the other is for universities to accumulate vast amounts of data about the activities of their communities. Borgman is the author of more than 250 publications in information studies, computer science, and communication. Her most recent book is Big Data, Little Data, No Data: Scholarship in the Networked World (MIT, 2015). Registration: 3:00 – 3:30 P.M. Presentation: 3:30 – 5:30 P.M. Reception: 5:30 – 6:30 P.M.
Two policy trends in access to data are beginning to clash, raising new challenges for universities and for individual faculty, students, and staff. One trend is for researchers to provide open access to their data as a condition for obtaining grant funding or publishing results in journals. The other trend is for universities to accumulate vast amounts of data about the activities of their communities in research, teaching, learning, services, and administration. Many of these data, both research and operational, fall outside privacy regulations such as HIPAA, FERPA, and PII. Universities are coming to see the value of these data for learning analytics, faculty evaluation, strategic decisions, and other sensitive matters. Commercial entities, governments, and private individuals also see value in these data; universities are besieged with requests for access. These conflicts pose challenges in balancing obligations for stewardship, trust, privacy, confidentiality – and often academic freedom – with the value of exploiting these data for analytical and commercial purposes. This talk will explore these trends, drawing on the pioneering work of the University of California in privacy and information security, data governance, and cyber risk. The 2017 EarthCube All-Hands Meeting, “Making Connections & Moving Forward,” aims to bridge the disciplinary divide between and among geoscientists and computer scientists by exploring the gaps in current implementations and finding where communications can be strengthened to foster adoption and discovery of resources. A celebration of the many contributions Judy and Gary have made to the Department of Informatics, UCI, and the research community at large. The DataONE Webinar Series is designed to engage participants in relevant and cutting-edge topics within the Earth and environmental sciences. Please join us for discussions on open science, the role of the data lifecycle, and achieving innovative science through shared data and ground-breaking tools. The Big Data to Knowledge (BD2K) Initiative presents this virtual lecture series on the data science underlying modern biomedical research. In this webinar Dr. Borgman and Irene Pasquetto discuss how researchers are producing an unprecedented amount of data by using new methods and instrumentation. By accessing and reusing these data, scientists can answer complex research problems that need systemic approaches to knowledge discovery. However, research data are often not readily available, and even when data are shared, they cannot be reused outside their original context of production. Based on our studies of data practices in science, we compare data sharing and reuse challenges faced by researchers in life sciences, oceanography, astronomy, molecular biology, and genomics. Data sharing difficulties include determining what to release, when, in what format, and by what means. Data reuse challenges include determining what data could be reused, by whom (expertise required), with whom (collaborative environments), under what conditions (issues of data quality and curation), why (needs for data integration, control a nd comparison), and to what effects (types of analysis). Presented at the Astronomy Journal Club Meeting, UCLA Division of Astronomy & Astrophysics, UCLA Los Angeles, CA. Panel Presentation presented at the Big Data in Education and Information Studies: A Symposium by Interactions, UCLA GSEI&IS Journal. The Southern California Climate Data Protection Project is committed to protecting and preserving scientific climate data, through systematic analysis of infrastructures and methods of data collection, curation, and management. They are equally concerned with how access to scientific data allows the public to invest in government accountability and to demand sustainable policies. Over 60 participates turned up for the morning panel and workshops. The panel discussion centered on the importance of the SAVE EVERYTHING default mode (the operational mantra of the Internet Archive), the vulnerabilities of small scientific data, decentralized archiving as an activist tactic, and the often physical pains climate scientists go through to produce a single datum. We then broke into groups to nominate federal websites to the Internet Archive, archive important federal datasets, create an advocacy toolkit for democratic action, and discuss future research projects around climate change science and archival practice. While the popularity of “big data” reflects the growth of data-intensive research, “little data” remains the norm in those many fields where evidence is scarce and labor-intensive to acquire. Until recently, data was considered part of the process of scholarship, essential but largely invisible. In the “big data” era, data have become valuable products to be captured, shared, reused, and sustained for the long term. They also have become contentious intellectual property to be protected, whether for proprietary, confidentiality, competition, or other reasons. Public policy leans toward open access to research data, but rarely provides the public investment necessary to sustain access. Enthusiasm for big data is obscuring the complexity and diversity of data in scholarship and the challenges for stewardship. Data practices are local, varying from field to field, individual to individual, and country to country. Until the larger questions of knowledge infrastructures and sustainability are addressed by research communities, “no data” may become the norm for many fields. This talk will explore the stakes and stakeholders in research data and implications for policy and practice, drawn from the presenter’s recent book, Big Data, Little Data, No Data: Scholarship in the Networked World (MIT Press, 2015). As scientific data grow in volume, velocity, and variety, they become ever more difficult to manage – whether by individual researchers, teams, libraries, archives, or repositories. Concurrently, researchers are asked to release and to share their data with the wider scientific community and with the public. “Data citation” frequently is viewed as a mechanism to provide credit to those who share data, to attribute data to appropriate sources, and to improve discovery and access. This wide array of objectives suggests that data citation is not a single mechanism but an amalgam of methods, goals, and practices. Data citation is making the transition from theory to implementation, posing new challenges for researchers, librarians, publishers, funding agencies, repositories, and other stakeholders. Among the complexities to consider are distinguishing between credit, attribution, and discovery; the diversity of data practices within and between scientific domains; and the origins of data citation in bibliometrics. The talk is drawn from the work of the CODATA-ICSTI Task Force on Data Citation and Attribution and from the presenter’s recent book, Big Data, Little Data, No Data: Scholarship in the Networked World (MIT Press, 2015). Infrastructures are not inherently durable or fragile, yet all are fragile over the long term. Durability requires care and maintenance of individual components and the links between them. Astronomy is an ideal domain in which to study knowledge infrastructures, due to its long history, transparency, and accumulation of observational data over a period of centuries. Research reported here draws upon a long-term study of scientific data practices to ask questions about the durability and fragility of infrastructures for data in astronomy. Methods include interviews, ethnography, and document analysis. As astronomy has become a digital science, the community has invested in shared instruments, data standards, digital archives, metadata and discovery services, and other relatively durable infrastructure components. Several features of data practices in astronomy contribute to the fragility of that infrastructure. These include different archiving practices between ground- and space-based missions, between sky surveys and investigator-led projects, and between observational and simulated data. Infrastructure components are tightly coupled, based on international agreements. However, the durability of these infrastructures relies on much invisible work – cataloging, metadata, and other labor conducted by information professionals. Continual investments in care and maintenance of the human and technical components of these infrastructures are necessary for sustainability. Researchers face competing challenges for access to their data. One is the pressure to make their data open in response to mandates from funding agencies, journals, and science policy makers. Second is the lack of resources – human, technical, economic, and institutional – to make their data open. Third is that good reasons exist to maintain control of their data, whether to protect the confidentiality of human subjects, to gain competitive advantage over other researchers, or the sheer difficulty of extracting data from the contexts in which they originated. Researchers are encouraged – or required – to contribute their data to archives, yet surprisingly little is known about the uses and users of digital data archives, about relationships between users and the staff of data archives, or how these behaviors vary by discipline, geographic region, policy, and other factors. Digital data archives are not a single type of institution, however. They vary widely in organizational structure, mission, collection, funding, and relationships to their users and other stakeholders. This talk draws upon an exploratory study of DANS, the Data Archiving and Networked Services of the Netherlands. We mined transaction logs to draw samples of contributors to DANS and consumers of DANS data (Borgman, Scharnhorst, Van den Berg, Van de Sompel, & Treloar, 2015) and then conducted interviews with DANS archivists, contributors, and consumers to examine who contributes data to DANS and why, who consumes data from DANS and why, and what roles archivists play in acquiring and disseminating data. Early findings suggest that motivations are complex, varied, and often contradictory, and that the uses and users of DANS are far more diverse than anticipated. Implications of these findings, which draw upon the premises of the presenter’s recent book Big Data, Little Data, No Data: Scholarship in the Networked World (2015), raise concerns for stakeholders in research data such as scholars, students, librarians, funding agencies, policy makers, publishers, and the public. Professor Christine Borgman, UCLA’s Presidential Chair in Information Studies, and a member of the Quello Center Advisory Board, will be giving a Quello Lecture on the 5th of October 2016 at MSU’s College of Arts and Sciences. 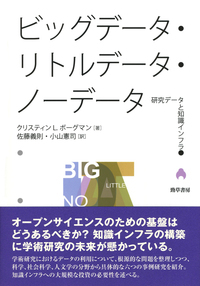 Her latest book is entitled Big Data, Little Data, No Data, which I interviewed her about for Voices from Oxford (VOX). My VOX interview with Christine was done when we were both at Balliol College and is at: http://www.voicesfromoxford.org/video/data-in-the-digital-domain/228 The interview is brief, just over 15 minutes, but I hope it will give you a sense of the wide range of topics that Christine is likely to develop here at MSU. Christine did her undergraduate degree here at MSU, and remains a loyal alum, and went on to a number of higher degrees, including a doctorate from Stanford in communication. You might notice the music introducing and concluding the video seems to accentuate our American accents, thanks to Sung Hee Kim, Director of VOX. Data sharing has become normative policy enforced by governments, funding agencies, journals, and other stakeholders. Reasons for data sharing include leveraging investments in research, reducing the need to collect new data, addressing new research questions by reusing or combining extant data, and reproducing research, which would lead to greater accountability, transparency, and less fraud. Much of the scholarship on data practices attempts to understand the sociotechnical barriers to sharing, with goals to design infrastructures, policies, and cultural interventions that will overcome these barriers. Yet data sharing and reuse are common practice in only a few fields. Astronomy and genomics in the sciences, survey research in the social sciences, and archaeology in the humanities are the typical exemplars, and remain the exceptions rather than the rule. The lack of success of data sharing policies, despite accelerating enforcement over the last decade, indicates the need not just for a much deeper understanding of the roles of data in contemporary science, but also for developing new models of scientific practice. This presentation will report on research in progress, funded by the Alfred P. Sloan Foundation, to examine three factors that appear to influence data practices across domains: How does the mix of domain expertise influence the collection, use, and reuse of data and vice versa? What factors of scale – such as data, discipline, distribution, and duration – influence research practices, and how? How does the centralization or decentralization of data collection influence use, reuse, curation, and project strategy, and vice versa? Context for this talk is drawn from the presenter’s recent book, Big Data, Little Data, No Data: Scholarship in the Networked World (MIT Press, 2015). · What perspective do you bring to open data in this domain? Creator, user, manager, observer, re-user, steward, policy maker, or other role? · What are these data and how are they used in science? · Who are the stakeholders in these data? · What is the scale of these data, in terms of volume, complexity, temporality, rates of change, and other factors? · What are the characteristics of data release in this community? · What are the characteristics of data reuse in this community? · What data are considered “open,” and how do notions of openness vary among the stakeholders in this community? Christine Borgman, who directs the Center for Knowledge Infrastructures at UCLA, will present framing remarks and moderate the panel. Irene Pasquetto, UCLA, will report findings from FaceBase, an NIH-funded collaboration to share data in craniofacial research. She will discuss how perspectives on open data in this community vary between scientists, computer scientists developing a sharing hub, and potential users. Also from UCLA, Ashley Sands will report on SDSS and LSST, two major astronomy sky surveys, with respect to how openness has evolved over the course of several decades. From NCAR, Matthew Mayernik presents a data professional’s perspective on how openness is manifested in different meteorological and atmospheric data repositories. Mark Parsons, RDA, will discuss how arctic data services evolved over multiple decades within the National Snow and Ice Data Center (NSIDC) as the array of stakeholders with interest in arctic data has expanded and uses of the data have become politically, as well as scientifically, contentious. After a 5-minute overview by Prof. Borgman, these five speakers will make 8 to 10-minute presentations, leaving 45 minutes for discussion with the audience. Even as the opportunities presented by offering access to and re-use of scientific data sets become more apparent, sharing human subject data in particular is hampered by lack of a framework to address privacy and security concerns. The Research Data Alliance (RDA) and the National Information Standards Organization (NISO) are working to address that challenge through a joint interest group building a global consensus framework that will support both privacy and scientific data sharing. Scholars in the humanities are unaccustomed to viewing their sources of evidence as data or to sharing and releasing those data as part of the publication process. Meanwhile, as more archival materials are digitized and as more cultural information is created in digital form, humanities scholars have turned to computational tools for analysis and interpretation. In turn, as the digital humanities adopt data-intensive methods, they often become subject to open access policies that governments, funding agencies, and publishers impose on science. The transition is an uneasy one for many scholars. This presentation centers on a case study of a Chinese Buddhist philologist whose scholarship employs evidence from material objects and digital resources to study the communication of Buddhist texts ca. 3rd to 5th century C.E. He was an early adopter of CBETA, a digital counterpart of the Taisho edition of the Chinese Buddhist canon. As CBETA expanded in scope and features over the course of a decade, it grew in value as a data source. Because these new tools are integrated into the knowledge infrastructure that serves his community, his scholarly products have become more portable across platforms, increasing the likelihood they will endure. However, these infrastructures remain fragile as they depend on invisible work to curate disparate content and technologies. 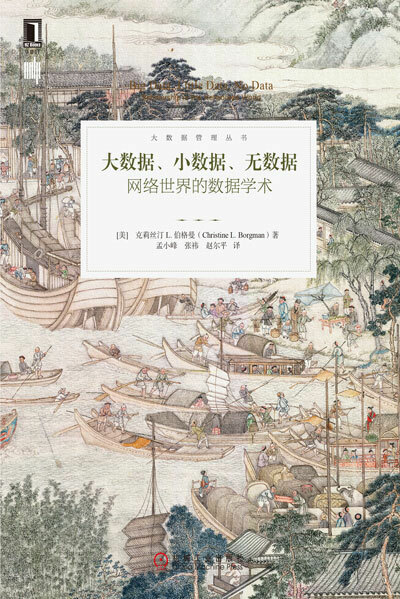 Chinese texts, both ancient and modern, are particularly difficult to digitize and encode for scholarly analysis. Problems of open access, data management, curation, preservation, and sustainability loom large for the digital humanities. The Chinese scholarship case study is set in the broader context of data in scholarly communication, drawn from the presenter’s recent book, Big Data, Little Data, No Data: Scholarship in the Networked World (MIT Press, 2015). Data practices are local, varying from field to field, individual to individual, and country to country. They are a lens to observe the rapidly changing landscape of scholarly work in the sciences, social sciences, and the humanities. Inside the black box of data is a plethora of research, technology, and policy issues. Concerns for data sharing and open access raise questions about what data to keep, what to share, when, how, and with whom. The stakes and stakeholders in research data are many and varied, posing new challenges for scholars, librarians, policy makers, publishers, students, and their partners. This talk is drawn from Big Data, Little Data, No Data: Scholarship in the Networked World (MIT Press, 2015), much of which was written at the University of Oxford when the author was an Oliver Smithies Fellow at Balliol College in 2012-2013. Data are essential to the process of scholarship, but remained largely invisible until the era of “big data.” The transition from process to product suggests that research data have become valuable objects in themselves to be captured, shared, reused, and sustained for the long term. Scientists, policy makers, governments, business, and the public alike now see great potential in reuse of research data. To reuse data requires that data creators are willing and able to share them. Therein lies the rub. Data also have become contentious intellectual property to be protected, whether for proprietary, confidentiality, competition, or other reasons. Data practices are local, varying from field to field, individual to individual, and country to country. Enthusiasm for big data is obscuring the complexity and diversity of data in scholarship and the challenges for stewardship. Public policy leans toward open access to research data, but rarely with the public investment necessary to sustain access. This talk will explore the stakes and stakeholders in research data and implications for policy and practice. Webinar: Big Data, Little Data, No data – Who is in Charge of Data Quality? The more value that is placed on research data as a commodity to be shared, sustained, and reused, the greater the need to assure the quality of those data. Data repositories—whether domain-specific or generic across domains—are essential gatekeepers of data sustainability. Data quality is a consideration throughout the research process. To what extent should responsibility for assuring data quality be the responsibility of the investigators; of publishers, editors, and peer reviewers; of data repositories; of data librarians or data scientists; or of later reusers of those data? Considerations for data quality vary throughout the lifecycle of data handling. These questions have neither simple nor generic answers. In this Webinar, Prof Christine Borgman (UCLA), author of 'Big Data, Little Data, No Data: Scholarship in the Networked World' (MIT Press, 2015), will explore these issues of responsibility for data quality in conversation with Dr Andrea Scharnhorst, head of the research and innovation group at DANS, an institute of the Royal Netherlands Academy of Arts and Sciences. Social Science Research Council and the New York Public Library host a series of panels that probes tools for an increasingly complex and connected world. Original thinkers Ann Pendleton-Jullian and John Seely Brown moderate the discussion. This conversation features game designer Elan Lee, Chris McNaboe of the Carter Center, Terry Young of Sparks and Honey, and former Navy SEAL Officer Coleman Ruiz. The University Committee on Academic Computing and Communications represents the University of California's Academic Senate in all matters involving the uses and impact of computing and communications technology. The FORCE2016 Research Communication and e­Scholarship Conference brings together a diverse group of people interested in changing the way in which scholarly and scientific information is communicated and shared. Data repositories are much more than “black boxes” where data go in but may never come out. Rather, they are situated in communities, with contributors, users, reusers, and repository staff who may engage actively or passively with participants. This talk will explore the roles that Dataverse plays – or could play – in individual communities. When and Why Should Research Data be Sustained? The goal of the workshop was to create a forum for direct interaction between the National Science Foundation large facilities and CI developer community – to explore evolving facility needs and approaches for CI, identify issues and solutions, exchange CI best practices and operational experience, and generate recommendations that can guide current and future NSF CI programs. Exploring Openness in Data and Science: What is “Open,” to Whom, When, and Why? In 2015-16, the CODATA-ICSTI Task Group on Data Citation Standards and Practices is organising a series of workshops in participating countries. The objective is to promote the implementation of data citation principles in the research policy and funding communities throughout the world. The DANS R&D colloquium is a meeting place for researchers, archivists and ICT specialists. Organized by DANS, its focus is on research data and what can be done with it. Data, data everywhere — but how to manage and govern? This talk identifies some of the challenges faced by universities in managing and governing complex categories of data. Material is drawn from Big Data, Little Data, No Data: Scholarship in the Networked World (Borgman, 2015, MIT Press) and the UCLA Data Governance Task Force (work in progress). This presentation addresses the challenges and opportunities for active research data management, and for better collaboration and discovery tools for more specialized research data. Based on the book Big Data, Little Data, No Data: Scholarship in the Networked World, this talk explores the stakes and stakeholders in research data and the challenges facing scholars, students, librarians, funding agencies, policy makers, publishers, and the public. This talk explores the role of data in scholarly communication and the implications for STM publishing. Why are data sharing and reuse so difficult to do? This talk, based on the book Big Data, Little Data, No Data: Scholarship in the Networked World, will explore the stakes and stakeholders in research data and the challenges facing scholars, students, librarians, funding agencies, policy makers, publishers, and the public. By celebrating the diversity of research data, their value and richness may be enhanced. However, that diversity poses challenges for preserving context, for stewardship, for exploiting data in collaborations across research domains, and for reuse over the short and long term. Keynote presentation for the Volkswagen Foundation's Herrenhausen Conference on "Big Data"
Claremont Graduate University Invited Lecture: This talk, based on the book Big Data, Little Data, No Data: Scholarship in the Networked World, will explore the stakes and stakeholders in research data and the challenges facing scholars, students, librarians, funding agencies, policy makers, publishers, and the public. The Plenaries are multi-day meetings held twice a year in various locations worldwide to provide the Research Data Alliance community an opportunity to network and collaborate with peers in various disciplines, and hear from industry experts and world leaders on topics related to research data sharing and exchange. A panel discussion, book signing, and celebration for Christine Borgman's new book. 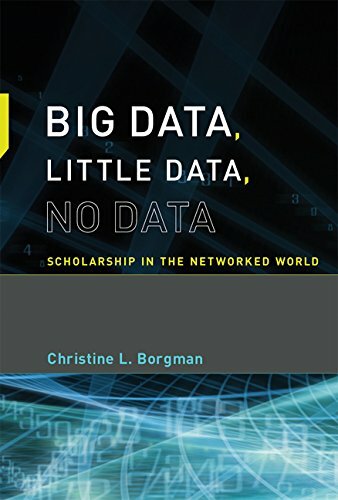 Join the UCLA Department of Information Studies and the UCLA library as we celebrate and host an exclusive book signing for Professor Christine Borgman's newest book, Big Data, Little Data, No Data: Scholarship in the Networked World, published February 1, 2015. Free admission. Open to the public. Light refreshments will be provided. Workshop presented by ICIS: Innovating Communication In Scholarship. Keynote based on Dr. Borgman's recent publication "Big Data, Little Data, No Data; Scholarship in the Networked World." Scholars are increasingly subject to pressures from funding bodies, disciplinary norms, professional and personal ethics, and institutional directives to share their research data and make it available for reuse. There is, however, a great deal of heterogeneity across the research enterprise with respect to what is meant by ‘data’ and ‘data sharing,’ why data sharing is deemed important, and what data management strategies are considered most effective. Moreover, data are often difficult and costly to produce and share. Therefore, many scholars view these as a significant product of their intellectual labor for which they should receive some sort of credit towards tenure and promotion, authorial recognition through citation, or financial compensation. This workshop will address theoretical concerns and pragmatic solutions that can be harnessed to help researchers comply with requirements or desires to share their data in ways they deem appropriate for their goals. Paper presentation of "Ship Space to Database: Scientific and Social Motivations for a Database to Support Deep Subseafloor Biosphere Research" (Darch & Borgman, 2014) at the Association for Information Science and Technology 2014 Annual Meeting (ASIS&T 2014) in Seattle. Big data, data-intensive science, and eScience are contemporary terms to describe research fields that generate, manipulate, and manage large volumes of data. Astronomy was among the first data-intensive fields, hence many other domains wish to learn from the experience of astronomers. Their knowledge infrastructure – an ecology of people, practices, technologies, institutions, material objects, and relationships – has accumulated over millennia. Over the last several decades, the practice of astronomy has transitioned from analog to digital technologies. In turn, the broad adoption of common tools, standards, and technologies has enabled astronomers to construct infrastructure components such as the Astrophysics Data System (ADS), the Strasbourg Astronomical Data Center (CDS), the NASA Extragalactic Database (NED), the Virtual Observatory, and data archives for missions such as Chandra, Hubble, and the Sloan Digital Sky Survey. While far from complete or seamless, the knowledge infrastructure for astronomy provides more comprehensive access to scientific publications and data than do most other scientific domains. This talk is drawn from continuing research by the Knowledge Infrastructures project on scholarship in astronomy (Borgman, Sands, Golshan, Darch, & Traweek, in progress) and a forthcoming book (Borgman, 2015). Open Access Week 2014 is an appropriate moment to explore open data, libraries, scholarship, and knowledge infrastructures. Research data are a lens to observe the rapidly changing landscape of scholarly work within and between domains of inquiry. Inside the black box of data is a plethora of research, technology, and policy issues. Data are best understood as representations of observations, objects, or other entities used as evidence of phenomena for the purposes of research or scholarship. Rarely do they stand alone, separable from software, protocols, lab and field conditions, and other context. Concerns for data sharing and open access raise questions about what data to keep, what to share, when, how, and with whom. Open data is sometimes viewed simply as releasing data without fees. In research contexts, open data may pose complex issues of licensing, ownership, responsibility, standards, interoperability, and legal harmonization. To scholars, data can be assets, liabilities, or both. To librarians, data also are scholarly products to curate for future users. However, data are much more difficult to manage than are publications, with a greater array of practices, technologies, players, and policies involved. This talk will explore the stakes and stakeholders in open access to research data, drawn from the forthcoming book, Big Data, Little Data, No Data: Scholarship in the Networked World, MIT Press, January, 2015. Bibliometrics, long the province of information science scholars, is attracting new devotees who wish to apply bibliometric principles to data citation. One reason for this development is the growth in data volume relative to storage and analytic capacities. Fields such as astronomy, physics, and genomics are producing more data than investigators can investigate themselves. By sharing and combining data from multiple sources, other researchers can ask new questions. Another factor is advances in the technical infrastructure for generating, managing, analyzing, and distributing data. Tools are more sophisticated, bandwidth capacity is greater, and transfer speeds continue to improve. Third, and by no means least, are associated shifts in research policy. Data are now viewed as significant research products in themselves, more than just adjuncts to publications. Funding agencies now expect investigators to capture, manage, and share their data. When viewed as research products, data deserve attribution similar to that of publications. Attribution, in turn, requires mechanisms for references to be made and citations to be received. Yet data are very different entities than publications. They take many more forms, both physical and digital, are far more malleable than publications, and practices vary immensely by individual, by research team, and by research area. Institutional practices to assure stewardship of data are far less mature than are practices to sustain access to publications. All of these factors contribute to the complexity of data citation and attribution. This talk is drawn from the forthcoming book, Big Data, Little Data, No Data: Scholarship in the Networked World, MIT Press, January, 2015. Click for Slides. New Trends in the eHumanities: “Big Data” offers today’s scholars vast opportunities for discovery and insight, but having the right data is often better than having more data. “Little data” can be just as valuable as big data. In many cases, scholars have no data ¬because relevant data do not exist, or cannot be found, or are not available. Moreover, sharing data is difficult, incentives to do so are minimal, and data practices vary widely across disciplines. The argument of this book is that data have no value or meaning in isolation; they exist within a knowledge infrastructure – an ecology of people, practices, technologies, institutions, material objects, and relationships. After laying out the premises of this wide-ranging investigation – six “provocations” meant to inspire discussion about the uses of data in scholarship; competing definitions of “data;” and social, policy, and economic aspects of research data – the book presents case studies of data scholarship in the sciences, the social sciences, and the humanities. The book also assesses the implications of these findings for scholarly practice and research policy. Concluding chapters explore releasing, sharing, and reusing data; credit, attribution, and discovery; and what to keep and why. In sum, the book argues that to manage and exploit data over the long term requires massive investment in knowledge infrastructures. At stake is the future of scholarship. Professor Christine L. Borgman presents inaugural lecture at Göttingen University on October 2, 2014. "Big Data, Little Data, Open Data" is the title of a public lecture to be held on Thursday, October 2, 2014, at Göttingen University by Christine L. Borgman, Professor and Presidential Chair in Information Studies at the University of California, Los Angeles (UCLA). The Göttingen State and University Library (SUB) organises the lecture in cooperation with Göttingen eResearch Alliance (eRA). The lecture in English commences at 18:00 CET in the Historical Library Building at Papendiek 14. It will launch the "Göttingen Lectures on Academic Information Futures", a new lecture series organised by the SUB. Lecture on "Big Data, Little Data, Open Data, and Scholarship“ and follow-up dicussion. For many years, Prof. Borgman has studied electronic scholarly communication and the role of research data. This fall, she is working as a guest researcher in the Netherlands. After giving the keynote speech at the Research Data Alliance plenary meeting we proudly welcome her as guest speaker and expert. Keynote Talk on "Data, Data, Everywhere, Nor Any Drop to Drink" at the Research Data Alliance Fourth Plenary Meeting in Amsterdam.Click for Slides. Panel Presentation of "Data in Motion: From Data to Science and Back" at the Research Data Alliance Fourth Plenary Meeting in Amsterdam. Visiting Fellow at Data Archiving and Networked Services (DANS), at the Hague and Amsterdam. Paper presentation of "The Ups and Downs of Knowledge Infrastructures in Science: Implications for Data Management," (Borgman, Darch, Sands, Wallis, & Traweek, 2014) at Digital Libraries, 2014. Click for Slides. The enthusiasm for “big data” is obscuring the complexity and diversity of data in scholarship. Inside the black box of “data” is a plethora of behavior, technology, and policy issues. Publish or perish remains the clarion call of today’s scholars. Now they are being asked to release their data as well, which marks a fundamental transition in scholarly communication. Data are not shiny objects that are easily exchanged. Rather, they are fuzzy and poorly bounded entities. Data flows are uneven – abundant in some areas and sparse in others, easily or rarely shared. Open access and open data are contested concepts that are often conflated. Data practices are local, varying from field to field, individual to individual, and country to country. Data are a lens to observe the rapidly changing landscape of scholarly practice in the sciences, social sciences, and the humanities. The future for libraries to manage the deluge of data is streaming with possibilities – and with challenges.